When the mulberries are in season, we get so many we are always on the lookout for delicious new recipes. Here’s one that combines this wonderful berry with BLUE KITCHEN Davidson’s Plum Conserve. Pastry: 130g butter at room temperature, 1 cup of flour, 130g almond or hazelnut meal, (though you could also substitute with pecan meal if you prefer), 150g sugar, 1 egg yolk. Mix all the ingredients for the crust, working the butter with your fingers. Alternatively process all ingredients in a food processor. The mix should begin to come together and stay when squeezed. Grease a 24cm pie dish, lining the bottom with baking paper, generously grease the sides as the linzertorte tends to stick. Roll 1/4 of the pastry dough between 2 sheets of baking paper into a strip, approximately 10 x 26 cm and about 2-3 mm thick. Set this aside in the freezer on a flat surface (eg stored frozen puff pastry or an oven tray if you have one that fits in your freezer). Take the remaining 3/4 of the pastry dough and press it into the pie dish ensuring that the rim is about 1 and1/2 cms high and about 1/2 cm thick. Remove the stems from the mulberries and place them in a heavy-based saucepan and cook gently over a low heat until they simmer in their own juice (there won’t be much juice). Remove from the heat and stir through the BLUE KITCHEN Davidson Plum Conserve. Allow to cool. 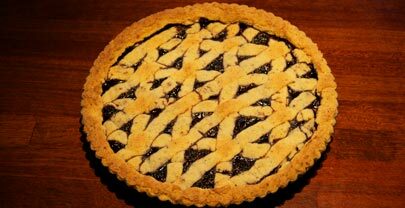 Fill the prepared pastry crust with the mulberry/conserve mix. Now fetch the frozen sheet of prepared pastry and carefully cut it into strips. As you cut them, transfer them to the top of the pie in a lattice pattern. It is important that the pastry remain firm as you do this, so returning the pastry to the freezer throughout the process may be necessary. I put the knife and spatula that I use when cutting and transferring the strips to the pie, in the freezer as well. 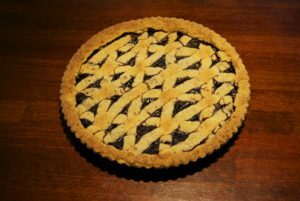 As this is a “spring thing” – mulberry’s cropping in spring as they do – and if the weather is warm, these tips about keeping the pastry cold and firm will help. Press down the edges of the pastry strips. Bake in a slow oven (150-160º C) for an hour, or until the edges turn light brown.